By 10:45 we are on a bus through no-man’s land (around 2 miles) to the Israeli side. 30 minutes in line, mostly in the hot sun until we reach the shade of the building, where large fans blow a mist of water on those in line, whether you like it or not (I did not), feeling like cattle. Then you give up your bags and your passport, and head for the metal detector. We are 40 minutes in to the process. T’s knee has set off the detector and as he waits for someone to frisk him, I write these notes in my notebook AND IT IS CONFISCATED AND I AM DIRECTED TO STEP ASIDE. A plain clothes security guy instructs me to sit. I am not allowed to collect my purse, and when Tom has passed out of security he is not allowed to sit with me or talk to me. A few minutes later a female plain clothes security person comes to question me. She sits on the bench with me and her tone is friendly, but she is looking into my eyes as she asks why I was writing, was I planning to publish it, why was I here, where were we going, how long was I staying, what did Tom teach, why on earth did we live in Lebanon (with genuine surprise; “Paris of the Middle East!” I reply), how long have we been there. “Your notebook says you felt like you were being treated like cattle, “ she says, and apologizes for that. “I did not like being sprayed with water,” I said. “Are you visiting anyone in Israel?” “No,” I reply, because I think of Ben in Palestine, not Israel. I was reunited with Tom, and we were free to go to the next stop, where, as Americans, we were invited to bypass one line, which spared us another half hour. The line for passport control took about 15 minutes. More questions: what are you doing here, where are you staying (we had been prepared for this with the name of a Jerusalem hotel), do you have an onward ticket. We said we planned to visit the Christian sites, which was true—we never lied. No questions about the totally blank passport, which we had obtained just for this trip (you cannot enter most Arab countries with an Israeli stamp in your passport). Our ignorance was a big help: we were asked if we planned to go to the West Bank and Tom answered, “I don’t know—what’s there?”. Our interrogator (young woman) traded a bemused glance at her neighbor (another young woman, and there were no further questions. Had they asked at any point if we were going to Palestine, or had we revealed that we were there to see our son in Ramallah, I am certain we would have been questioned much more seriously. Just last month our Palestinian-American friends (born and raised in the US) were detained for 7 hours at the border, while their backgrounds were looked into, and their 88 year old relative strip searched. Another American colleague, an activist, who was headed for Palestine made it through in 4 ½ and considered himself lucky. We also later found out that they have started giving visas that allow you to enter Palestinian territory only—no Israel, or vice versa. We were very lucky to have received permission to visit both. It’s a police state. The whole place made me (K) fearful. Enraged and fearful. Back to the border, after the passport stamp we were on to luggage retrieval. A sea of bags in a large room. We find ours and are free to go, 3 hours from start to finish. We head for currency exchange and are ripped off by a terrible rate. There is no information booth and we struggle to find a bus. A Palestinian lady tries to tell me where to go but I don’t understand. We end up on a minibus for Jerusalem, where we will have to change for another bus to Ramallah. 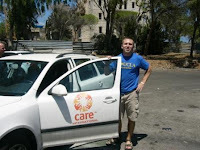 We meet Ben in Ramallah—here he is in the CARE car he drives. In the hotel room in Ramallah there is a Koran and a prayer rug in the alcohol-free hotel. 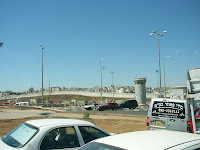 Here is the first wall we saw, heading into Ramallah. The 30 foot wall separates Palestinian West Bank from Israel. 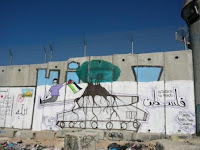 And the same wall, but from the Ramallah side. 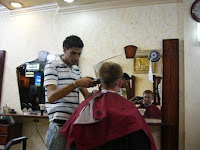 And Ben getting a haircut in Ramallah. And outside the home for the elderly where he rents a room (on a different floor!). And in a garden (rare!) outside the Ramallah Friends School, which I think has been bombed more than once. 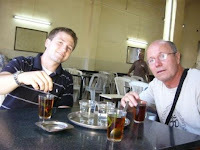 And Tom and Ben enjoying tea with fresh mint in Ramallah. Basically, this place is a desert—Israel and, certainly, Palestine. We leave for Haifa. As we near Tel Aviv, which we will not enter, there starts to be more vegetation. So the illegal, but allowed, settlements, HUNDREDS of them, are on the tops of hills, pretty much the top of every hill, with walls of barbed wire halfway up the sides of the hill. “Settlements” means land stolen by conservative Israelis from Arabs who mostly have lived there for generations and who may even own a piece of paper attesting to their ownership. It doesn’t matter—the Israeli Army (Internal Defense Force) protects the intruders rather than the owners. The settlements look very much like US suburban housing developments. Large, solid homes. There are some newer ones that have a more prefab look. There are more all the time—still a few hill tops left. And they are conspicuously green—how do they pump all that water uphill, I wonder? While driving we pass water spigots that the nearby Bedouins aren’t allowed to use. The racism isn’t, in a sense, discriminatory: they have uprooted Christians as well. A monastic order that had been there for 1500 years were harassed to the point at where the monks had to leave; there was a spring nearby that the settlers wanted. They feel they are entitled, and I guess nothing else matters. I struggle with rage so near the surface. I remind myself of all the Israeli peacemakers I have heard of, of the brave women who stand near the worst checkpoints to monitor treatment of Palestinians trying to pass through, and are there to intervene and try to help when needed. I recall the many wise Beirut taxi drivers I have met who, after asking where I was from, were so quick to say “ we don’t like Bush, but we like Americans”. The ability to separate government or even religious policy from individual action—this is important. 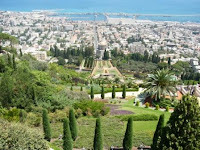 In Haifa, where many well to do Palestinians previously lived, we see the fabulous hillside gardens around the world-famous Bahai temple There are 100 full-time gardeners (how do they mow at such an angle?). Tom navigates our journey. He consults four different maps with different publication dates. Each shows different routes because so many new roads are being constructed. I see on one map that Beirut is a mere 90 kilometers to the north. We arrive in Nazareth, and a church built on top of where an angel visited Mary to tell her she was going to be mother to Jesus. We stay the night in a convent there. Everything is expensive in Israel! 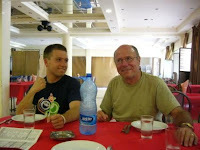 This “inexpensive” lodging is 20 Euros per person per night, or over $100 for 3 of us. Coffee is $2.50. 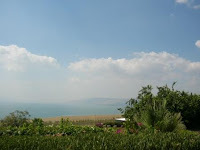 Next day: we discover that the Sea of Galilee is a big lake. Towns that dot the shore include ones named “Hawaii” and “Nirvana”. It is beautiful, but particularly so because the surrounding country is so dry. We visit Heptapegeon, where the miracle of the loaves and fishes is said to have occurred. 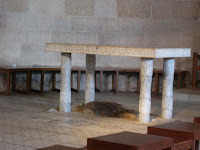 Photo shows an altar above the stone where the miracle took place. And the Church of the Beatitudes—a very lovely spot overlooking the Sea of Galilee. During our visit a small group of West Africans is holding a mass. 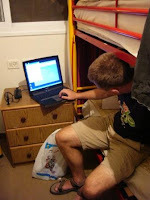 Ben says later that Africans kn ow how to do it right. Their singing was so sweet. Here is the view from the Church of the Beatitudes. We head to the Golan Heights. Captured from Syria and Lebanon in the 1967 War and later, it is now prime vacation lands for Israelis. Hilly, with some shrubby foliage but otherwise dry and brown. 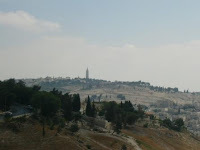 If there is ever a treaty they will likely give up the land east of the Jordan River, and the Mt. Hermon ski slope in the Golan that is currently theirs. We have hiked just on the other side of Mt. Hermon in Lebanon! 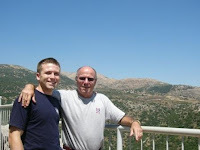 We wave to Lebanon, and look at it from the town of Metula, at what used to be called the “Good Fence”. For a time they allowed Lebanese farmers to cross the border to farm crops or work in Israeli hotels. No more. Here are Ben and Tom with Mt. Hermon in the background. We stay at a YMCA that is in a former privately owned villa, right on the shore. We have a swim. Later, we ask about the small domes we see just off the shore at various spots around the Sea of Galilee. The proprietor tells us, with disgust, that they are pumping the water from all the springs feeding the Sea, to elsewhere in the country. The fish come to the springs to breed, and the birds migrating from Europe to Africa and back come to eat the fish. What will become of them? 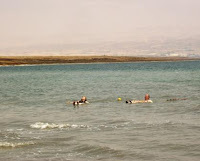 And the level of the Sea will go down, just like the Dead Sea which shrinks by meters (yards) every year. Next day we are off to the Dead Sea—1,385 feet below sea level! As we near it things look more and more “dead”—dry and brown, little habitation. We stop for the obligatory soak, and plaster ourselves with a bit of the healing mud. You don’t want to go in with any cuts or blisters, as it really stings. And don’t let the water get in your eyes—ouch. As we had seen from the Jordanian side of the Sea last year, sea level has way dropped, mainly owing to agricultural use. We see a former dock that is high and dry at about 20 feet in the air. Sad! 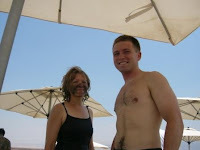 Photos show Dead Sea, us floating and free mud pack. 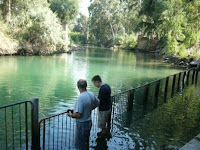 We move on, stopping at the Jordan River. Here are Ben and Tom wading in the River, which later reduces to a trickle. Lots of people come here to be baptized, though it is not the place where Jesus was baptized, which is right on the (Jordan) border and off limits to everyone (even settlers!). We go on to Jericho. 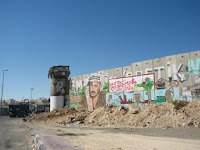 Jericho is in the Occupied Palestine Territory. 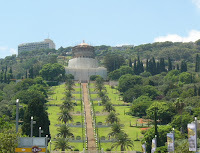 It is home to the most conservative Moslems and the largest Jewish settlement. It also claims to be the oldest continually inhabited city on earth (so does Byblos, in Lebanon). No permanent structures are allowed in this area, yet settlements continue to grow. You can tell them by the barbed wire fences around and the suspicious green color of the land. The water distribution is clear: green here (illegal settlers) and brown there (“legal” Palestinians).We also see that Israeli “illegal” settlers have blocked the main highway into town, so you have to drive all the way around to enter the city. I ask why. Ben says it was done because the road passed through the settlement and they didn’t want Palestinians there. I find myself knowing I should work to muster some love so I don’t add to the palpable hate that I feel here. I can’t. I just can’t! I cry out for reason, for sanity. If I could meet people and talk I’m sure it would be there, the connection, the sharing. If only Israeli conservative and Palestinian farmer could meet and talk. It is too simple. It is so needed. That’s what it will take: 1 to 1. Openness, kindness, understanding. People are just people. But the settlers?? 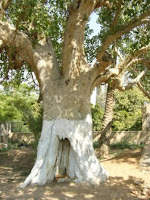 We pass Zaccheus’ tree—2000 years old! On the way to Bethlehem where we will spend the night, it seems like there are more settlers than Palestinians, in this the land set aside for Palestinians. There is a big Fatah governmental meeting while we are there, at the Bethlehem Peace Center. There are lots of shiny black cars and press. We spot a reporter we know from Al Jazeera TV, and ask to take her photo. She is very nice and even remembers my name as we say goodbye. 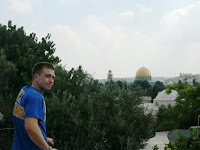 Next day we drive south to see the city of Hebron. It is refreshing to be in a poor but vibrant Palestinian city. 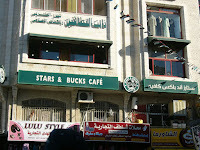 It is a little further from the walls than Bethlehem or Ramallah, which seems to give it a little more breathing room. On the other hand, if your car has Palestinian license plates you can never leave. And somehow we don’t see the ultraorthodox Jewish settlement we read about in the center of town. Apparently there are 17 settlements in the vicinity of Hebron, housing 12,000 Jews. 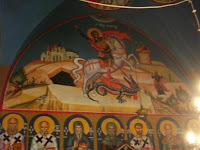 We make our way to a church near Bethlehem honoring St. George, of dragon fame. St. George is holy to Christians, Jews, and Moslems, and this church was formerly the one place all came together to pray. Since the Intifada Jews don't come any more. Such a pity. We have so much in common. 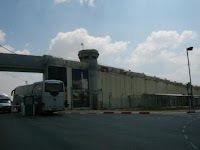 The West Bank really is a big prison in some ways. The oppression is chipping away at the strong cultural and community fabric of the Palestinian people. Really, how much can one take before one shouts in anger or throws a stone? This has been going on for 60 years. 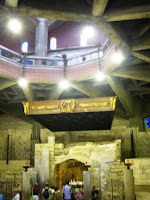 In Bethlehem we visit a church built on the spot where Jesus was said to have been born. 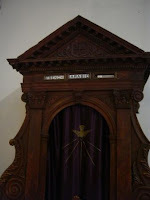 You enter by the “Door of Humility”. One confessional booth offers French and Arabic, another Spanish, English, and Italian for the many visitors. 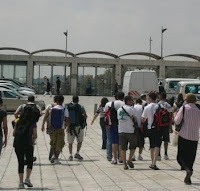 We wait 15 minutes at the checkpoint crossing from Bethlehem into Jerusalem. There are three sets of guards, three bars to be raised, a set of tire puncturing studs, one trunk search, one bag search (“what’s in the bag?” “A cross”). 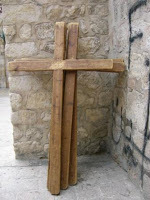 It was made of olive wood and newly purchased at Nativity Square, center of love and peace just a mile or two away. Here, the guard makes us get out of the car so he can see our faces, instead of leaving his guardhouse and walking to the car. 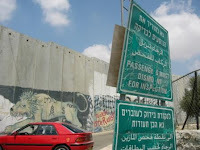 Photos of the wall outside Bethlehem, and a sign telling who may exit. 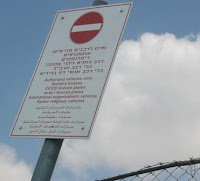 It says "Authorized vehicles only: Tourist busses, CC/CD (diplomatic) license plates, Israeli license plates, international organizations license plates, senior religious vehicles". No Palestinians. There is an illegal permanent settlement on top of the Mt. of Olives, above the Garden of Gethsemane—Arab land. They bulldozed Palestinian homes to build it. We hear the Israeli government no longer considers any of Jerusalem, a city as holy to Moslems as to Jews, Arab land. 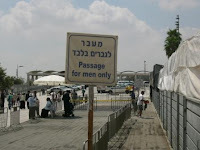 K heard a news report saying that the Jerusalem mayor has decided to change all the road signs to be in Hebrew only. No more Arabic or English. Oh America, my country—this is your tax dollars at work! This is foreign aid gone badly, badly awry. Israel in this form could not exist without the massive amount of support we give it every single year in military aid. 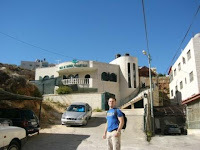 We stay the night in a B&B in West Jerusalem, in a neighborhood with many orthodox Jews. Will I be stoned if I walk around in my sleeveless dress? Maybe. It is a bit scary. We note that the only English news station on the TV is Fox! 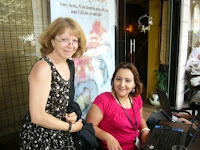 The lady who runs the B&B is very, very nice, and I am so grateful to meet a lovely Israeli person. I needed that. She confirms that I may have trouble being sleeveless in the neighborhood. 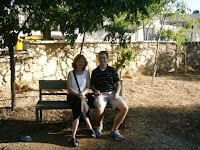 Our last day we tour the Old City of Jerusalem. 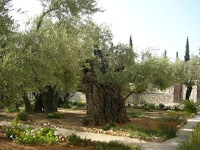 Here is the Garden of Gethsemane—with 2000 year old olive trees! And the Mt. of Olives. 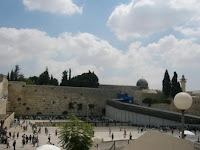 And the Wailing Wall with Al Aqsa Mosque behind. And a sign near the city walls. And an off duty soldier in the crowd at the Wailing Wall—do you see him in the light shorts at the center? Off duty IDF forces are required to carry their weapons with them at all times. 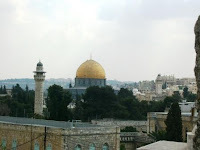 Here is the classic Jerusalem shot of the Dome of the Rock. With a classic boy. And here is a shop in the Christian Quarter, with Jewish, Christian and Palestinian cloths for sale. 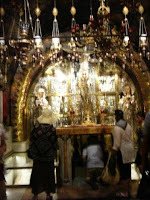 We visit the Church of the Holy Sepulchur, built where Calvary once stood. We follow the stations of the cross and stand where Jesus was beaten, given the cross to carry, saw his mother in the crowd, told some people to cry for their own sons but not for him, where he fell, where the Romans had Simon help him carry the cross, where he was crucified, and where the tomb was discovered. I am much more moved than I thought I would be at seeing these things. It is very powerful to know that people from all over the world, of three (or more?) different faiths travel from countries all over the world to see these things and be moved by them too. 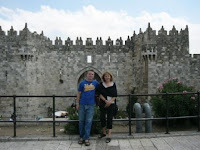 Here are Ben and K at the Damascus Gate outside the Old City walls of Jerusalem . We stay the night with Ben’s boss at CARE. She is welcoming and kind and thinks the world of Ben :-). 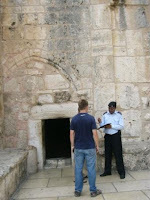 It is much easier to leave Jerusalem than to enter. Here is the wall, stretching for miles. On the way to the Jordanian border, signs show the dropping elevation as we near the Dead Sea that separates the two countries. At 500 feet below sea level my ears pop. It is a hilly and barren wasteland here, then becomes flat with occasional bits of scrub. 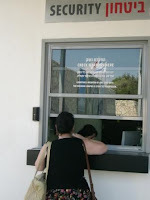 At the border, locals have to stand in three lines: Ministry of Interior, exit tax and passport control. Foreigners only the latter two. The exit tax is steep (you can pay by credit card)--~$40 a person. We are an hour and 10 minutes at the Israeli side, then a bus to the Jordan side. What a relief to be out of Israel and the Occupied Territory! What tension, constantly wary of being stopped, interrogated or even stoned, making way for orthodox Jews who feel and act as if they own the sidewalk and may even teach their three year olds to spit at Arabs. And I am a privileged American who can leave at any time! The constant oppression breeds simmering rage, a dull hatred. It is a horrid way to live. Tom says the behavior is borderline social obtuseness or social incompetence—even if you did understand how to be polite and respectful you wouldn’t know how to do it. He doesn’t like either possibility. At the Amman airport we see the Lebanese Army Taekwondo Team arrive on the plane that will carry us to Beirut. 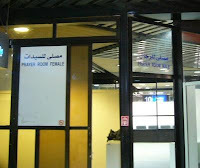 Here is a photo from the Amman airport--the signs say "Prayer Room Female" and "Prayer Room Male". If Jordan was a relief, Lebanon was practically Heaven. Our new apartment has four balconies. The main one is large enough for 3 or 4 people to sit. The bougainvillea is in bloom there—both pink and white. 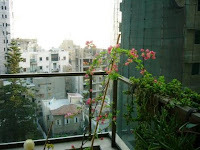 The smaller balcony off the living room hosts a potted palm, and the one off the small bedroom a clothes drying rack. The balcony off the main bedroom has a plastic table and two chairs provided by the school. There are six buildings under construction in the immediate view from the main balcony. Most of them are are between us and the sea. We returned from the US to find the smaller building straight in front considerably taller than before and rapidly encroaching on our view. The rebar protrudes above its 7th floor—we watch with alarm and wonder if it will rise to 8 and obliterate the connection with the Mediterranean we enjoy from the living room couch?? Each day we get out the binoculars and scope it out. The base of the building is not large—maybe 25 X 30 feet—how much height can it support? Buildings here use massive amounts of concrete. And there is construction everywhere, especially along the Corniche (sea road). Giant new buildings sit empty—who do they imagine will fill them? Gulf money (Saudi, Kuwaiti, UAE) has built many of them. There’s rebar and concrete for the frames, then concrete blocks to fill in. Workers walk along narrow boards many stories above the ground. We saw some workers wearing fluorescent green vests one day—that was noteworthy. And it was only for one day. Haven’t seen a one with a helmet either. It’s a fascinating show, seven days a week.